The idea behind the posts is that you share with us your Tactical Parenting Hacks for the week. It can be anything as simple as that you have cooked fish fingers or a clever idea you have had to entertain your children. 2. Add one post only per week. 3. Posts may be new or old. 4. Leave a comment on BOTH of the Hosts’ posts and at least TWO other posts. (Four in total.) Remember that this is all about sharing the blogging love, so the more you can comment on the better. 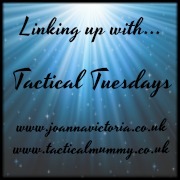 Don’t forget to use the hashtag #TacticalTuesdays when commenting. 5. Tweet @tacticalmummy and @joannabayford and include #TacticalTuesdays and at least one of us will retweet you. 6. The Linky will run weekly from Tuesday until Sunday. We are really excited about this Linky and are very much looking forward to reading your posts.